Properties in La Cetina average 4.6 out of 5 stars. 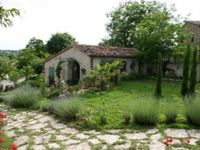 Property 3: Ancient farmhouse of 1600 with panoramic pool.1 km from the village. Beautiful house on Chianti hilltop with exceptional views. 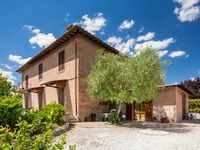 Property 6: Beautiful house on Chianti hilltop with exceptional views. LA CASA NUOVA - apartment in holiday house with pool in the tuscan countryside. Property 22: LA CASA NUOVA - apartment in holiday house with pool in the tuscan countryside. Independent barn ideal for 3 people, with a big private and fenced garden. The hamlet of Montalcinello is at walking distance. Property 25: Independent barn ideal for 3 people, with a big private and fenced garden. The hamlet of Montalcinello is at walking distance. Caggio di Sotto was a nice place to stay in Tuscany. It was not far from Siena and other hilltop towns we wanted to visit. As well, because it is located on a farm it is quiet, something we seek out. The environment was lush, green, and lovely. We had the stone cottage, which allowed us to come and go whenever we wished. The stone walls provide no insulation, so it was quite cold inside when we arrived. The pellet stove can handle only one room at a time. The kitchen had all the appliances one expects except a microwave oven, which we would have appreciated for reheating tea and coffee. There is a heated towel rack in the bathroom, and we appreciate that. Our host, Vera, was quite cordial and spoke French, a language we share, so we had several good conversations. Caggio di Sotto is a good base for day trips around this part of Tuscany and there are several restaurants (we recommend Futura Osteria) a few minutes drive away. It is also a nice area in which to stroll through olive orchards and verdant fields. We stayed two nights, and enjoyed this location to explore Tuscany. The flat has everything you need, and the outside area is a wonderful place to relax and enjoy a bottle of the region's chianti.